At the best of times, many of us can be quite crude in the morning before getting their coffee on, especially in the heat of Panama. And a hung-over Elliott can feel quite delicate until he has put himself on the outside of a hearty bowl of Panamanian sancocho. Ah, my perfect Panamanian sancocho! A manly breakfast guaranteed to sooth the soles of the broken and weak while they tenderly piece together the events of the night before. While every culture appears to have their version of chicken soup as a restorative measure, sancocho is the order of the day around these parts. But I don’t claim sancocho is exclusively Panamanian any more than I claim it to be a soup rather than a stew. The only claim I make is that my Panamanian sancocho is the perfect hangover cure for me! I tried my first kind bowl of sancocho not long after arriving in Panama. It wasn’t particularly morning anymore, but it was the first daylight I had seen after a confusing trail of events involving secco and lots of dancing. After missing breakfast (and lunch) we decided to try out Jap Jap across the road from our hotel. A local, lowbrow eatery that served this magical dish I had been so recommended for occasions like this. Inicia el Mes con Sabores de Nuestra Casa😍😍😍 Le ofrecemos varias opciones de comida Rica y Sabrosa para todos los gustos!!! Una tradición que lleva mas de 20 años!! Pollo Asado, Chuletas , Sancocho, Emparedados , Pizzas , Club Sandwich , Hamburgesas, Calzones , Ensaladas, Una grande variedad de Acompañamientos, Bebidas, Dulces etc. NO SE OLVIDE QUE VIERNES SABADO Y DOMINGO con 2 PIZZAS FAMILIARES le regalamos 1.5 Lt de Soda cualquier Sabor!!! Para pedidos a domicilio llamenos al 221-1160 // 221-1230 // 224-3159 desde las 10:00 A.M. hasta las 12:00 A.M. There is nothing more wretched than the sight of a middle-aged gringo with a hangover in the heat of Panama City trying to cross a busy street in cargo shorts. If my snow white legs were not enough to stop traffic, the fact I was an obvious newbie in town was. Every taxi stopped to offer me a ride, creating enough of a bottleneck for me to get across the road in one piece. Although a hot bowl of soupy stew seemed counter-productive in this heat, it sat well on my delicate stomach – and in such a warm, cozy, reassuring way. I noticed, for the first time, that only gringos wear shorts. My brain was working again! Now, whenever we have friends over from out of town, I make a big pot of sancocho for the weekend. Like the best stews, sancocho tastes so much better the next day and is perfect to have on hand for emergencies! Each region has its own angle of sancocho (‘parboiled’) with variants including different meats and vegetables. 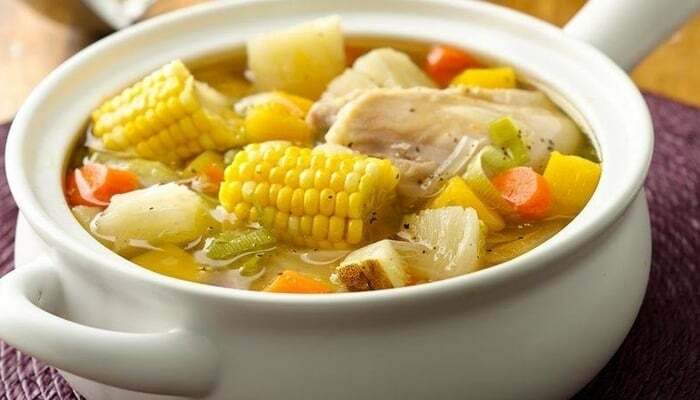 When you order sancocho in Panama, you will expect the classic sancocho de gallina (with chicken). This Panamanian classic version is the base to my recipe. A staple that deserves to be on every, pale-legged, cargo short wearing, middle-aged gringo’s fridge door. This recipe calls for chunky ingredients, everything in good solid chunks! Rub the chicken in the oil mixed with the minced garlic, oregano, and chopped culantro (this is a long-leaved relative to cilantro – if you can’t find it, double the amount of cilantro to substitute), and chop into sections, bone in. Throw it in a large pot on medium heat to sweat while you chop the vegetables into no less than one-inch chunks, leaving the potatoes whole. Not only does this make it a hearty safari to eat – it allows it to boil in anger and reheated without turning to mush. Now chuck in the onion before adding the stock and those vegetables. The sweet corn in Panama is more starchy and less sweet. If you use regular sweet corn and the carrots it will be too sweet. Cover it with water, bring to the boil and let simmer. Adding water if it gets too low, boiling back down if it gets too runny. You know when it’s ready. Chicken tender and yucca soft enough to stab with a fork. Serve as a main with rice straight away, or leave to infuse the flavors in the pot for a morning brunch. You can adapt and evolve a lot of the ingredients to your taste and use any starchy vegetable or any meat. As a national dish enjoyed with friends and family, I’m sure many will criticize my version. But it is damn good and does its job! If you really want to upset the locals – add a dash of Tabasco to your bowl! Yum!